Bend, Oregon's LSA builder X-Air, makers of the completely American-made X-Air LS - lowest-priced LSA out there at under $60,000 - is finding creative ways to keep the overhead low by selling the airplane directly out of its factory. 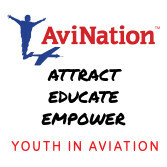 *** The company is upgrading the airplane in several ways, to be announced at Sun 'n Fun, and will offer demo flights, flight training, sales and service at the HQ in Bend. *** And if you need another reason to go to Bend, it's a good town on the eastern side of the spectacular Cascade range. I've spent time there over the years and always enjoyed its natural beauty. The composite aircraft kitmaker Lancair is also located in Bend. *** Matt Verdieck, X-Air's friendly GM who helped me demo the X-Air at Sebring (that flight report will be out soon in Plane & Pilot), says the company plans to set up flight centers around the country as well as keep selling through Sportsplanes.com. *** "Ultimately," says Verdieck, "we hope to see the aircraft on the ramps of numerous flight training operations." *** He goes on to comment on the economics of flying the Jabiru 80 hp-powered X-Air, which is a low-maintenance, fuel-sipping LSA to be sure. Bend, Oregon’s LSA builder X-Air, makers of the completely American-made X-Air LS – lowest-priced LSA out there at under $60,000 – is finding creative ways to keep the overhead low by selling the airplane directly out of its factory. 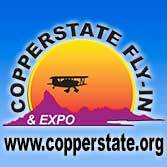 *** The company is upgrading the airplane in several ways, to be announced at Sun ‘n Fun, and will offer demo flights, flight training, sales and service at the HQ in Bend. *** And if you need another reason to go to Bend, it’s a good town on the eastern side of the spectacular Cascade range. I’ve spent time there over the years and always enjoyed its natural beauty. The composite aircraft kitmaker Lancair is also located in Bend. *** Matt Verdieck, X-Air’s friendly GM who helped me demo the X-Air at Sebring (that flight report will be out soon in Plane & Pilot), says the company plans to set up flight centers around the country as well as keep selling through Sportsplanes.com. A good basic flyer that can also be a good trainer, X-Air LS comes standard with flaps, trim, Icom radio, Dynon engine monitor, and basic flight instrumentation. 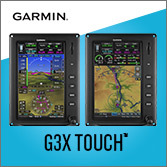 Options include more fuel, Garmin GTX 327, Garmin GPS, and more. 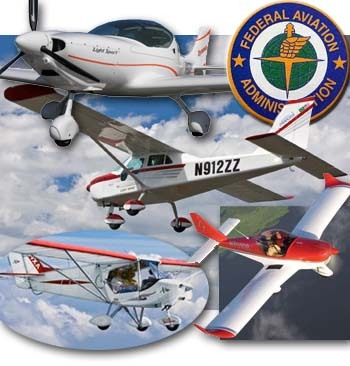 Many pilots have complained about the high prices of Light-Sport Aircraft. Customers expected figures like $50,000 or $60,000 (and we had choices at that price in 2003). Now, double or more is common. Read why. But not always. X-Air LS comes in at a surprisingly modest $46,900. Yes, it has sewn Dacron wings (though that helps keep it lighter; no painting). No, it isn't as sleek as the carbon fiber jobs. Others can fly a bit faster (cruise is 90 mph). Yet for $20,000 less than we thought they should be five years ago -- and about one-third the cost of many LSA today -- X-Air LS will find some buyers. 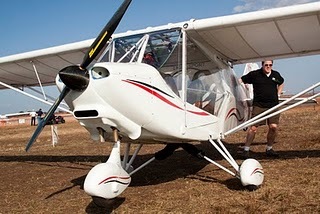 Indeed, X-Air had a good start at the Flying magazine Parade of Pistons, selling a LSA to the high and fast crowd. X-Air comes standard with the 85-hp Jabiru 2200, giving it spirited performance at very low fuel usage. In response to demands for lower cost LSA, X-Air's Justin Reimer said, "Now you have it with the X-Air LS...an entry level aircraft at an entry level price!" X-Air began pursuing SLSA status only six months ago and worked through the ASTM requirements quickly due to the thorough testing of the design by a seasoned team at X-Air. Many pilots have complained about the high prices of Light-Sport Aircraft. Customers expected figures like $50,000 or $60,000 (and we had choices at that price in 2003). Now, double or more is common. Read why. But not always. X-Air LS comes in at a surprisingly modest $46,900. Yes, it has sewn Dacron wings (though that helps keep it lighter; no painting). No, it isn’t as sleek as the carbon fiber jobs. Others can fly a bit faster (cruise is 90 mph). Yet for $20,000 less than we thought they should be five years ago — and about one-third the cost of many LSA today — X-Air LS will find some buyers. Indeed, X-Air had a good start at the Flying magazine Parade of Pistons, selling a LSA to the high and fast crowd. X-Air comes standard with the 85-hp Jabiru 2200, giving it spirited performance at very low fuel usage. The relationship between Weedhopper and X-Air LS is hard to identify anymore. But articles here on ByDanJohnson.com reveal the history. Read reviews of the X-Air H or the X-Air Standard and F models. See X-Air LS specs. Upon seeing modern LSA, many aviators say, "Oh, these aren't 'those ultralights' at all." Truth be told, even those ultralights aren't ultralights any more. Today, a certified but ultralight-like aircraft will be either Special or Experimental LSA. *** Witness what I'll call the "return" of the X-Air. I've reported on this design as it has evolved (see photo legend). Astute visitors may recognize X-Air LS as an evolution of the pioneering Weedhopper, though little of the original design remains. The latest iteration of this venerable design is working to gain SLSA airworthiness. X-Air founder and designer, Joel Koechlin, has three decades of experience in light aircraft. His X-Air series has been a mainstay among European microlights for 15 years, selling more than 1,200 copies. *** The coming SLSA model employs the 85-hp Jabiru 2200 powerplant. Koechlin said, "This aircraft is exactly what the LSA category was meant for; it is light and easy to fly and simply fun!" U.S. marketer Justin Reimer reported, "The X-Air LS will be introduced as a lower cost entry-level aircraft with excellent training qualities." Customers are impressed by the initial ready-to-fly price of $46,900, the best bargain yet among three axis Light-Sport Aircraft. 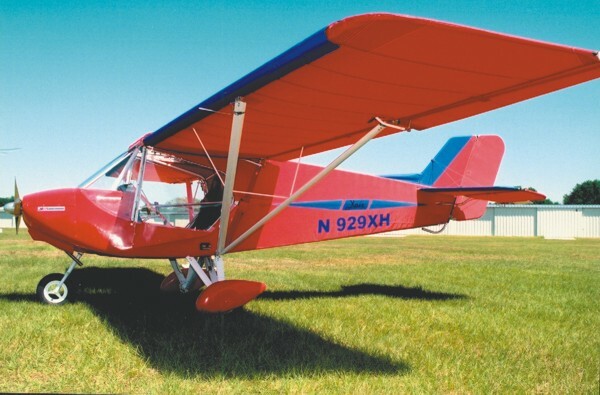 Upon seeing modern LSA, many aviators say, “Oh, these aren’t ‘those ultralights’ at all.” Truth be told, even those ultralights aren’t ultralights any more. Today, a certified but ultralight-like aircraft will be either Special or Experimental LSA. *** Witness what I’ll call the “return” of the X-Air. I’ve reported on this design as it has evolved (see photo legend). Astute visitors may recognize X-Air LS as an evolution of the pioneering Weedhopper, though little of the original design remains. The latest iteration of this venerable design is working to gain SLSA airworthiness. 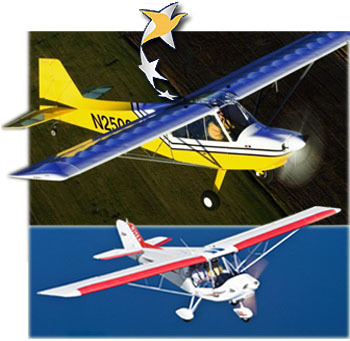 X-Air founder and designer, Joel Koechlin, has three decades of experience in light aircraft. His X-Air series has been a mainstay among European microlights for 15 years, selling more than 1,200 copies. *** The coming SLSA model employs the 85-hp Jabiru 2200 powerplant. Koechlin said, “This aircraft is exactly what the LSA category was meant for; it is light and easy to fly and simply fun!” U.S.
NEW & FAMILIAR - The Xair H, renamed for the American market, resembles a combination of Xair/Weedhopper and Coyote, but is a new design from the French designer and Indian factory. TIGHTLY COWLED - The Xair H fiberglass nose neatly houses the Jabiru 2200 4-stroke engine. Note the familiar and durable Xair-style landing gear. IN-FLIGHT TRIM - Viewed from the tail feathers, the Xair H's in-flight trim is easily inspected. Note the fuselage cutout to accommodate the movement of the elevator control (one tube drives each side of the elevator surfaces). FOLDING PIN - Bill Magrini shows where one of two leading edge pins must be removed to start the wing-folding process. In addition, you remove three pins on each dual-strut assembly. QUICK REMOVAL - Bracing wires running to the leading edge of the vertical stabilizer are pinned in place and are part of the quick removal system for the horizontal stabilizer. OVERHEAD CONTROLS - In this view you see in-flight trim in the foreground and the four-notch flap control immediately behind it. The controls are convenient but block some of the skylight's openness. STURDY GEAR - Among other qualities, this solid gear construction assures the Xair H can deliver reasonable landings to learning pilots. BIG PANEL - You have plenty of room, perhaps more than you need in the Xair H's big instrument panel. On the right is room for a whole stack of radios, or you can keep it simple as Bill Magrini did. SHAPELY SEATS - You tend to stay put in these supportively curved seats with padded upholstery. Four-point pilot restraints are standard. Note the dual, wood-handled joysticks and throttles. DISCRETE FLAPS - From the Xair F model comes these separate flap surfaces. The older Xair F introduced this development where the standard Xair had full-span ailerons only. U.S. IMPORTER - Bill Magrini took over the Xair distributorship for America and since began representing the newest Xair H model from Randkar/Raj Hamsa. SMALL JABIRU - The Jabiru 2200 provides 80 horsepower and makes the Xair H quite the performer while being miserly on fuel. It costs about $2,000 less than the 81-hp Rotax 912. UPDATE 2008: The following article preceded the arrival of the X-Air LS offered by X-Air LSA, certified in 2008 as a Special Light-Sport Aircraft under ASTM standards. The article below appears unchanged from the original, but the airframe is essentially identical. So, while panel changes were made along with a few minor updates, flying qualities reported in the following article should largely match that of the new LSA version. It was Tax Day, April 15, and I prepared to fly an Xair H (N#929XH) owned by importer Bill Magrini of Light Wing Aircraft. It seemed an appropriate day to forget about what I owed the Internal Revenue Service and to enjoy some ultralight flying. Fortunately, the Xair H didn't disappoint. The Xair H isn't the designer or fabricator's name for the new plane. When I first saw the then-prototype design at a French airshow in '02, the new model was named Hanuman, which means little to American pilots. Magrini has probably chosen well to rename the aircraft for the U.S. market. He calls this model the Xair H as he represents the earlier standard Xair and the latter Xair F, and because he knew the Xair was a somewhat-recognized brand name among Yankee pilots. The Xair H is a derivative of the earlier Xair models that were based on the Weedhopper, though that lineage is increasingly hard to tell. The Xair H is a new design that borrows from lessons learned with the older Xairs. In India, where the Xair aircraft are fabricated, the new model is called Hanuman, referring to an Indian folklore icon. India has a rich history of symbols like Hanuman and most Americans would be baffled by these legends. From a brief study I determined the significance was that Hanuman was given the ability to fly and this may have suggested the name. Magrini didn't want to constantly explain - I don't blame him - plus he wanted to employ the familiarity of the Xair models so Hanuman became Xair H. Vaguely Familiar The Xair H has a slight sweep to the leading edge, though its trailing edge is straight. As with much of the design, this follows the gently swept leading edge of the Xair and its ancestor, the Weedhopper. The wing has become leaner since the Weedhopper days and the trailing edge busier. That groundbreaking American design had no wing control surfaces; it relied solely on the tailplane's elevator and rudder. The Weedhopper was a 2-axis airplane while the Xair H is conventional in its 3-axis and flap configuration. The aft spar parallels the leading edge spar, yet no sweep is used on the Xair H's wing trailing edge, a result of the flaps and ailerons having a tapering chord (thinning toward the tip) that makes the trailing edge perpendicular to the fuselage. Another major change from the ancient Weedhopper days is the relatively modern function of folding wings, an option. While not as slick as some creations - Germany's FK-9 can be done by one person with a single disconnect action - Xair H designers clearly thought through the process. What they developed has several clevis pins in strategic places. Properly prepared for flight, you have redundant fasteners to make sure things stay where you put them. The Xair H's wing-folding procedure is handled this way: You start by unsafetying and removing a couple of pins at the leading edge - one inside the cabin and one outside. Then you move to another where the joined wing struts meet the lower fuselage. Finally, you have two more where the struts join the wings, for a total of five pins per side to be able to fold/unfold the wings. Removing all these pins will allow you to pull the wing out of its sockets about 8 inches. A cable inside prevents you from pulling it too far. Once the wing is sufficiently removed, a hinge allows you to fold the wings aft. But before you take this step, you'll want to remove an upper and lower pin for the horizontal stabilizer so that surface can be unplugged. After a few minutes (following a few practice sessions), your Xair will be ready for transport or lower-cost hangar storage. The old Weedhoppers, like most ultralights of its day, used a tiny little fuel tank. The modern Xair H has a large fuel tank to accompany larger engines. For example, a Rotax 582 is pretty thirsty compared to the old Weedhopper single-banger. The container is now an 80-liter/20.8-gallon container filled from outside the aircraft through a fuel filler behind a zippered opening. It's possible to spill fuel inside the fuselage, so you'll want to take care not to make a stink inside the passenger compartment. Airy Cabin The center section of the Xair H fuselage above the occupants is covered with a fiberglass component. Squaring off the cabin by this means made the compartment seem far larger than on the older Xair series. Those aircraft had inward sloping tubing structures needed to connect with the main tailboom airframe. Using a square structure similar to the RANS S-6 Coyote will provide Xair H occupants with much more headroom. The fiberglass upper surface allowed four rectangular skylights to be inserted. These gave the cabin more light and a generally more airy feel, but they weren't particularly useful for traffic spotting or the like. Quite a few components - flaps and trim levers along with their control linkages and some structural members - are mounted in this same area, somewhat blocking the view out of the skylights. With its boxier cabin, creating doors to fit the fuselage was easier than on the standard Xair. Lightweight aluminum frame doors seal up the cabin reasonably well for moderate temperatures. A major benefit of the new squared construction is far easier entry than on the standard Xairs. Magrini notes the elastic system that holds the door closed is quite basic - just a piece of bungee cord - though you have to admit it is effective at its job and visually easy to verify. Magrini plans to improve the closure method when he widens the cabin. It's a minor gripe, but some buyers may expect expect more. The door panels follow the line of the nose fiberglass, carrying the solid look at the bottom. Magrini plans to change this to make the entire door clear. More important than the door coloration, Magrini will also bow the doors outward. This will widen the effective cockpit from 45 inches to 51 inches, which will make for a very roomy cabin. A center console allows more room for instruments and is handy to reach, but somewhat cramped the space inside the cockpit. Throughout the interior, the manufacturer made use of nicely finished wood components. The joystick handles were wood, as were the throttle lever ends, the trim lever grip and the flap lever end plus detent knobs. The wood accents gave a classy look to the interior contrasted with its bright white powder-coated aluminum tubing. 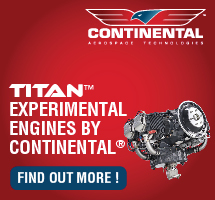 Our test aircraft used Grand Rapids Technologies' EIS engine monitoring system to give us our engine readings. This is highly useful installation t a modest price, but as neither Magrini nor I were fully conversant with the instrument, we struggled a bit to find the right information when we needed it. Besides the electronic box, we had a conventional airspeed indicator and an altimeter. An EIS or other electronic data display can save panel space while offering lots of information. Because the Xair H's 80-hp Jabiru 2200 4-stroke engine runs at revolutions familiar to a general aviation pilot, it's useful to have a carburetor heat control when you sufficiently reduce engine power. However, shutting down is just like most 2-stroke ultralights where you just switch the mags off and it stops. No mixture control was installed on the test aircraft. The Jabiru 4-stroke started up briskly and ran smoothly, although it produced some vibrations at very low settings. On the ground while taxiing, the extensive fiberglass in front of the occupants reflects that low idle roughness, moving rather liberally. All the features plus the larger engine of the Xair H has increased the price and boosted empty weight, which can significantly affect overall performance and handling in some aircraft. Our test Xair H weighed 600 pounds empty - albeit it with many extras - compared to 490 pounds for the standard Xair with basic equip ment, Magrini says. The Jabiru is much more potent than the 65-hp Rotax 582 2-cycle engine, which is standard for the basic Xair (also available on the Xair H), but some of the power is used to lift the extra 110 pounds of empty weight on the H model. That's somewhat an unfair comparison as the Xair H is also larger and more comfortable with greater control options, but additional empty weight on any aircraft is to be generally avoided. Launch and Land As I would later find with the flight controls, the flap lever was rather firm to move, enough so that I could engage the third notch of flaps only with some difficulty. Such tightness will surely loosen up somewhat as the aircraft gets more time on it. The flap difficulty wasn't so much air loads as ergonomics; the overhead control didn't allow the leverage needed to move the control easily. Magrini reports he has since removed a friction point and strategically applied some lithium grease, which he said made the flap lever easier to operate. For takeoff, Magrini recommended that I use two notches of flaps and I also used two notches of flaps for every landing, even though a good bit of wind was blowing diagonally across the runway. Two notches were easy to set. In this configuration, takeoff roll was very short, even less than I expected with 80 horsepower doing the pulling. The wing airfoil clearly benefits the slow end of the speed spectrum. Partially deploying the flaps helped us achieve slow flight while exploring flight characteristics at only 40 mph, so I knew what to expect when I came in for that first landing. Of my three landings, one was beautiful and two were rather firm. Though I tended to approach a little faster than suggested, I still seemed to run out of energy quicker than expected and this lead to the firm touchdowns. It seems mostly a matter of energy management and I was unfamiliar and therefore a bit sloppy at first. Fortunately, durable gear will let you refine your skills. Weather conditions that day didn't help my landings. It was a bit gusty with irregular wind direction. On one landing, the bottom fell out before I got the wheels on the ground. The gear system, composed of three legs with bungee cord shock absorption, held up well under my unintentional trials. The Xair H might perform very well in a training environment. Magrini told me to approach at 50 mph, but I preferred a slightly faster approach of 60 mph, slowing to 50 once over the runway. The conditions suggested more speed was prudent but, after feeling the stalls, I'm sure a 50-mph approach would be satisfactory once you were more experienced with the Xair H. Slips I performed were reasonably effective but because of some stick-range limitations, I couldn't make the slips particularly deep. Fortunately the flaps provide the descent control you may wish. Tight Yet Crisp I felt the ailerons, rudder and elevator were all on the tight side. In the Xair H's defense, it was a very new aircraft that had barely flown off its 40 hours. Magrini's lithium grease treatment would probably help make all the controls operate more fluidly. I'd get his advice on following this procedure with any new kit. The stick range to the right was somewhat limited with me seated in the left seat. Magrini said that on takeoff I should be prepared to use plenty of right rudder to offset P-factor. While I didn't notice that quality with any particular definition, I did find that on left pattern turns, I ran out of right stick when trying to roll back to level flight in bumpy conditions. The problem may have been related to a misadjusted control surface. On checking over the airplane after a lot of airshow flying, Magrini found the controls weren't perfectly aligned anymore. He feels the adjustment he made after this observation cured the stick-range just mentioned. In general, control surfaces seem rather small for the fuselage size but they exhibited adequate authority. We operated in 30° to 45° gusting crosswinds. In some ultralights, such conditions might make it a struggle to retain full control of the airplane on approach to landing. However, the Xair H showed good authority, even considering the stiff control linkages. The Xair H used for evaluation was fitted with an 80-hp Jabiru 2200 4-cylinder powerplant. 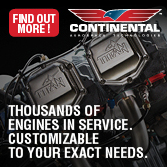 You can also choose the 65-hp Rotax 582 2-cycle or the 81-hp Rotax 912 4-stroke engine, though the latter choice will add a few dollars to the price without adding more horsepower. At full throttle, the Jabiru 2200 ran up into the yellow speed arc. I recorded a peak tachometer reading of 2,800 rpm. Jabiru USA recommends running at 2,750 rpm for high cruise setting, which will translate to about 100 mph in the Xair H. This is fine in smooth air, but in rowdier conditions, you'd want to back off to assure staying out of the yellow arc. When operating at more conventional settings - 2,400 to 2,600 rpm - the airspeed indicator showed the Xair H cruising between 80 to 90 mph. Fuel usage at such a setting would be very low, in the range of 2.5 to 2.75 gallons per hour (gph), Magrini says. Fuel costs can be further restrained through the use of auto gas, yet the economy of the Jabiru on the Xair H is quickly appreciated when gas is more than $2 a gallon. Best climbing is done at 53 mph, where you'll see close to 1,000 fpm. Best glide speed is a trifle faster. Glide angle is reported at 10-to-1 at 56 mph, the same speed at which minimum sink rate is listed at 490 feet per minute (fpm). The latter figure I can accept but glide is harder to evaluate. Certainly the Xair H does not fall out of the sky power-off. I calculated about 500 to 600 fpm of engine-off descent, but the day was variable, making any measurement less meaningful. My experience with stalling the Xair H was uniformly positive. The factory states, "no-flap stalls at 39 mph, stall with flaps down 25° at 36 mph, and stall with flaps down 45° at 33 mph." With no flaps, I found stalls to occur slightly below 40 mph; I noted 36 mph on several stall breaks. As always, this is subject to instrument error. Power-off stalls broke slightly but not significantly. Power-on stalls and accelerated stalls got quite wobbly before incipient stall but never revealed any sudden tendencies. Better Light-Sport Aircraft Deal The airplane is solidly built. It performs well with the 80-hp Jabiru 2200. Handling is good and will be better when control linkage stiffness disappears. The cabin is quite roomy and controls are convenient. Several desirable features are standard. Cruise performance is in the upper range of typical ultralight speeds. Stability is very good. But what you keep coming back to is price. 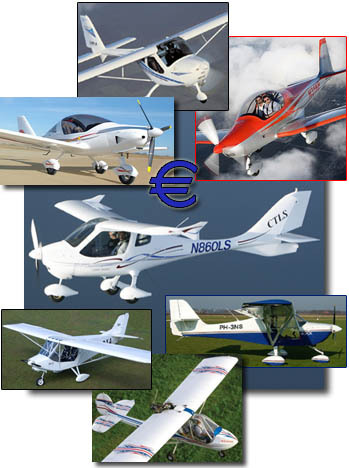 Many European Light-Sport Aircraft (LSA) candidates, nearly all of those built with composite construction, have become expensive. In 2 weeks alone, the price of European euros rose from $1.28 to $1.32 representing an increase of more than $2,500 (U.S.) on an $80,000 aircraft. Euro LSA prices have migrated steadily into the high $80,000 range with some topping $120,000. Some fear these prices could squelch a major development for light sport aviation. This is where the Xair H may come to the rescue, but let me remind you we're comparing apples and oranges. First, the Xair H is a kit, where the high-end Euro LSA candidates are ready-to-fly aircraft. 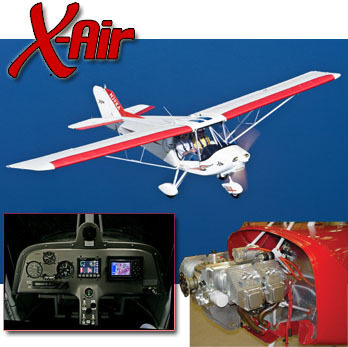 Even if you can build an Xair H in 100 to 120 hours (says importer bill Magrini -- please check with X-Air LSA for the latest prices), this must be factored in when comparing the investment. Secondly, many of the high-end aircraft are loaded with instruments and have full interiors plus other refinements. 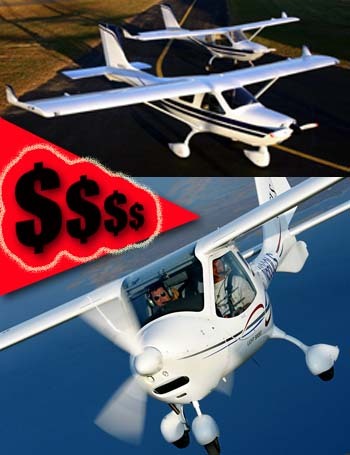 You shouldn't try to exactly compare these aircraft with an Xair H. With the Jabiru 2200, an instrument package, 2-blade wood prop and even at the euro-pushed price of $59,995 (in early 2009), the X-Air LS Special Light-Sport Aircraft represents a bargain in a LSA world where prices commonly exceed $100,000 or more. For those who once built this kit... even after you add 100 to 120 hours of kit-assembly labor to the plane, the X-Air model still looks cost-effective. Were you to value your time at $50 an hour, 100-120 hours of work adds only $5,000 to $6,000 to the kit price tag. I have no question that you should look at the Xair H if you are seeking a fully enclosed, conventional handling, 4-stroke-powered aircraft with higher end ultralight aircraft-level performance - all for a relatively modest investment. Its sturdiness suggests good application in a flight school or for novice flying. With cruise in the 90s, a spacious cockpit, and a bit of in-flight accessible storage space, the airplane can satisfy more experienced pilots as well. To aid your decision, Light Wing Aircraft offers a brochure and a new Xair H DVD said to provide "hundreds of assembly and finished Xair pictures, and a short video." For $10 you can't go wrong, but be advised. It might capture your heart and you'll spend more on your own Xair H kit. 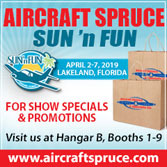 A final reminder in 2009... contact X-Air LSA for the latest pricing and other details. 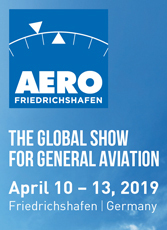 Notes: 1 Referred to as "maximum structural weight" though the airplane has been limited to 992 pounds gross weight under European "ultralight" rules. Standard Features Tested with Jabiru 2200 air- and oil-cooled engine with electric starting, 20.8-gallon fuel tank, wheelpants, doors, drum brakes, in-flight trim, luggage compartment, streamlined struts and landing gear legs, dual controls including throttles, folding wings (standard at time of flight evaluation; check with company). 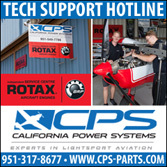 Options Rotax 582 2-cycle engine and electric starter if desired (lower cost), or 81-hp Rotax 912 4-stroke (greater cost) engine, instruments, prop, floats (folding wings may be optional depending on time of order). Construction Aluminum tubing airframe, fiberglass fairing, sewn Dacron® polyester fabric wing coverings. Designed in France, fabricated in India; distributed by U.S.-owned Light Wing Aircraft. Pros - Fresh variation on onetime Weedhopper theme, via the standard Xair. New model has full enclosure for occupants and engine plus RANS Coyotelike tail structure. 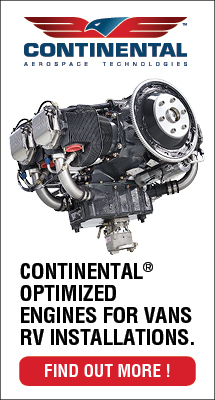 Supports larger 80-horse engines like Jabiru and Rotax. Aluminum tubing under sewn Dacron® polyester fabric structure is familiar to ultralight pilots. Folding wing option. Cons - Empty weight seems high at 600 pounds for what appears to be a simple airplane (though it has a good equipment list). Some may view this as an "old" design even though it's new. Imports like the Xair H change value depending on foreign exchange rates. Dealer representation is sparse in USA. Pros - Four-position flaps, in-flight trim, electric starting, and toe brakes come standard on the Jabiru Xair H (for a fairly modest $27,000/100- to 120-hour kit). Fueling has its own zippered port. EIS system saved panel space, reduced complexity and serves nicely for both occupants while leaving plenty of room for additional gear. Cons - All those systems add empty weight. Though fueling is done from the outside, the position might allow some spillage, which may cause odor in the cabin. Brakes were only installed on the left. Trim has no position indicator except your memory. Flaps were stiff to operate (see article). Pros - Roomy cabin at 45 inches, with plans to widen through curved door panels (to 51 inches, says importer). Full enclosure keeps the elements out fairly well. Easier entry than the standard Xair series. Storage area behind the occupants is accessible in-flight (though the cloth "shelf" holds only lightweight objects). Cons - Toe brakes were on the left side only, lessening value for training aircraft. Cabin might be a bit leaky for the coldest climates. Door latches worked well, but bungee cords aren't up to the modern standards for LSA hardware. Doors are very lightly built (not that I objected). Pros - Gear seems very stoutly built and able to take considerable punishment without deformation; may be a good training aircraft for this reason. Bungee cord suspension is simple and well-proven. Differential braking aids ground maneuverability; turn radius could be quite tight. Cons - No toe brakes on the right side may inhibit some training operations; steering maneuverability is much less without differential braking. Skylights are sufficiently obstructed by tubing and levers to restrict traffic visibility. Stiffer controls didn't help me sense ground-quartering winds. Pros - Gear absorbs firm landings with ease and tended not to rebound significantly; the Xair H stays planted one you've touched down at slower speeds. Slips were acceptably effective though two notches of flaps were better, and easier. Good clearance for off-field landings. Cons - My experience was that I lost energy and landed firmly two out of three tries (the good one proves my technique was at fault for the others); though glide is reported strong, energy bleed in ground effect seemed swift. Stick ran out of right-stick range for deep slip operations (operated from left seat - see article). Pros - Controls provided good authority for slower speed approaches in crossing winds. Precision turns to headings were very predictable. Though rudder (and all tail surfaces) seemed on the small side, the rudder was quite potent. Steep turns held bank angles easily. Cons - All controls were on the tight side (but this was a new airplane which had barely flown off its 40-hour requirement). Dutch rolls went well but only to shallow angles, probably due to the tight control linkages. The rudder felt more powerful than the ailerons, indicating a small degree of disharmony. Pros - The Jabiru in test aircraft climbed very well (close to 1,000 fpm) and made for short takeoffs (about 250 feet). All gear legs and struts are faired for reduced drag. Cruise in the low 90s will be fast enough for many buyers. Fuel consumption with the Jabiru is stated as 2.5 to 2.75 gph, quite economical for 80 horsepower. Glide quoted at 10-to-1 at 56 mph. Cons - Compared to the slicker - and much more expensive - composite aircraft from Eastern Europe, the Xair H lacks the cleanliness to offer greater speed range. The Jabiru 4-stroke is a heavier and more costly option than the 65-hp Rotax 582 2-cycle engine. 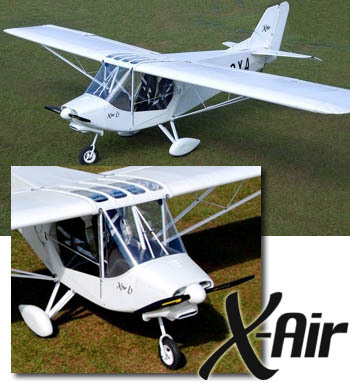 The Xair H seemed to lose energy easily in ground effect (affected some landings). Pros - All stalls ended modestly, without significant nose-over or altitude loss; easily controlled. Though rudder is small, its power seems abundant. Clean stalls are listed at 39 mph, with a similar or better number showing on the installed ASI. Full-flap stalls drop to 33 mph (claimed, not measured). Cons - Stalls wandered directionally near stall (though nothing sudden happened as a result). Longitudinal stability is positive but was slow returning to level flight (perhaps as thrust line is near neutral). No parachute was installed so no unusual attitude work was done. Slips showed some stick-range issues. Pros - To ultralighters, the Xair H offers a proven, familiar construction with common performance and handling that moves into the range of light-sport aircraft. Speed range will satisfy most sport pilots (39 to 100+ mph). Very reasonable pricing in an age of increasingly costly light-sport aircraft; $27,000 complete with Jabiru 4-stroke for a 100- to 120-hour kit. Cons - Engine access is not particularly good; cowl must be removed. Handling felt too firm for my preference (though it may loosen as aircraft gets more time on it). No determination made of manufacturer's ability to meet LSA rules. 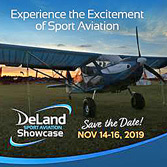 Sparse dealer network to support aircraft. UPDATE 2008: The following article preceded the arrival of the X-Air LS offered by X-Air LSA, certified in 2008 as a Special Light-Sport Aircraft under ASTM standards. The article below appears unchanged from the original, but the airframe is essentially identical. So, while panel changes were made along with a few minor updates, flying qualities reported in the following article should largely match that of the new LSA version. It was Tax Day, April 15, and I prepared to fly an Xair H (N#929XH) owned by importer Bill Magrini of Light Wing Aircraft. It seemed an appropriate day to forget about what I owed the Internal Revenue Service and to enjoy some ultralight flying. Fortunately, the Xair H didn’t disappoint. The Xair H isn’t the designer or fabricator’s name for the new plane. When I first saw the then-prototype design at a French airshow in ’02, the new model was named Hanuman, which means little to American pilots.